The village of Vonnas, France (pop. 2,381) where the 3-star Michelin rated restaurant-hotel Georges Blanc is found, is just south of Dijon in the Bresse plain that abuts the eastern edge of the great Burgundian domains of Beaujolais, Chablis, Beaune and Macon. The farms here are famous for the toothsome, blue-legged poulet de Bresse; grain and milk-fed chickens bred and raised like Kentucky thoroughbreds and about as expensive. Vonnas is scrubbed, swept and alive with colour, every square inch not devoted to some other purpose having been been planted with flowers. 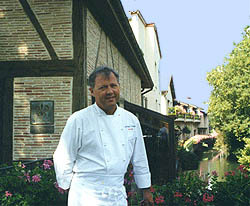 And the village square is dominated on three sides by the properties that make up the George Blanc establishment: the half-timbered brick hotel and restaurant (32 rooms, six apartments); the Ancienne Auberge, a reproduction of the original Blanc family restaurant featuring a modestly-priced menu; and the store, which sells preserves and charcuterie, fine china and flatware, cooking utensils, wine and gifts. One of Italy's most glamorous Tuscany resorts, Relais & Chateaux Hotel Il Pellicano, is now offering week-long gourmet cooking school courses. The courses are taught by Antonio Guida, Chef of Relais & Chateaux Il Pellicano. Chef Guida teaches traditional Italian dishes that use local products. The gourmet Italian cooking classes are conducted in English and the cooking class size limited to just 10 people. Learn how to prepare authentic Risotto, Italian bread making, fabulous desserts plus visit local wineries to sample and learn about Italian wines. For two weeks in January each year the Niagara region in Ontario is transformed into a winter wonderland, celebrating one of Canada's most cherished products, Ontario Icewine. From Gala evenings, ornate ice bars and Winemakers' Dinners, to roasting chestnuts, late night Icewine grape picking and sleigh rides along Niagara's famed Ontario wine route, the annual Niagara Icewine Festival offers plenty for every taste. Read about the Niagara Icewine Festival as we sample ice wine and brave the weather to report back. For all you wandering gourmands visiting Paris France, here's the all important list of all the Michelin star-rated restaurants in Paris, including 3-star Michelin restaurants, plus 2-star and 1-star Michelin rated gourmet restaurants. List includes addresses, telephone numbers and email addresses. World Travel Guide .com - reviews and recommendations of the very best in gourmet food and gourmet restaurants around the world. We'll take you to some of the world's best gourmet shops and gourmet restaurants including, Michelin 3-star restaurants. Internet Marketing Services by Blue Cat Design Inc.